04 Mart 2019 Pazartesi 20:00 - 3 reads. Cycling the track cycling world CHAMPIONSHIPS in Poland, Pruszkow, Kenny De Ketele and Robbe Ghys become third in the ploegkoers. The Belgian duo drove a strong madison, and our fellow countrymen had only the Germans and the Danes for themselves. Australia, the top favourite, was fourth. The Belgians, who, last summer, European champion in Glasgow, totaliseerden after 200 rounds, and 20 sprints, good for 50 km, 82 points. The gold went in this olympic discipline to the German titelverdedigers Roger Kluge and Theo Reinhardt. They did it with 105 points for the Danish Lasse Norman Hansen and Casper Von Folsach (84 points). Belgium now has two medals in Pruszkow. Jolien D'hoore won Wednesday's bronze in the scratch. 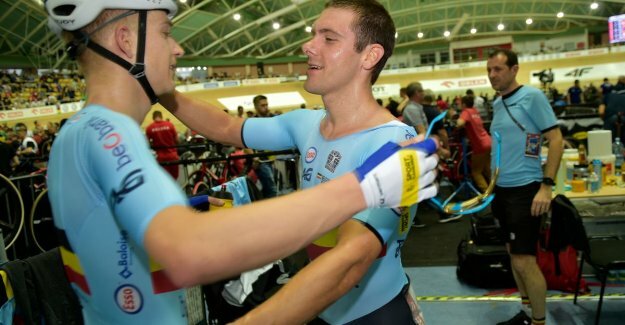 Titelverdedigster Nicky Degrendele Sunday still in action in the keirin final.